Abstract: The Fatty Case is a complete departure from typical no-name crap cases with their poor design, and tin foil like metal construction. "The Fatty Case" is name that our man Bao came up with to describe this generic $60CDN no-name OEM box. The Fatty Case is a complete departure from typical no-name crap cases with their poor design and tin foil like metal construction. The Fatty Case is 'strong like tank'. The thing is huge, ugly, and surprisingly well designed. 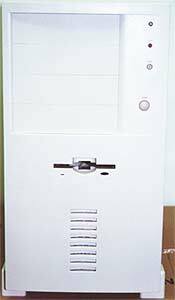 The side panels are made with steel so thick it could stop a bullet (*note side panels do not stop bullets), and a decent attempt was made to round over the typically razor sharp edges which plague many of today's cheaper cases. With a pile of new gear; motherboards, cpu, powersupply, ram, and assorted other goodies the last thing you want is to be is held up getting it all into your case. You know those cases, the one's which make getting into them some sort of fun game. Ya right, fun. 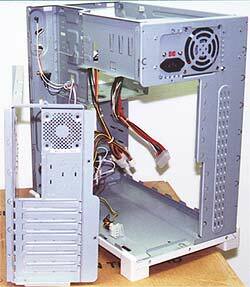 The fatty case works like this, unscrew the side panel to get at the CPU, slot cards, ram and drives. Unscrew the other side to get at the motherboard tray. It pulls back and sort of folds out (hell it even has an integrated carry handle). Unscrew the top panel to get easier access to the power supply. To remove knockouts or install a drive just yank the front bezel off. The motherboard tray pulls back and slides out for easy hardware insertion. Pg 2. Answer me this!